This is the second installment of The Fly Fishers Glossary: Snippets From the Underbelly of Fly Fishing, Fly Tying, Fish Biology, Dusty old Facts, Hallucinations, and the Plain Truth as I know it. A state of mind that overcomes fly anglers who are contemplating the merits of going off on a fishing trip versus staying home, going to work, or the like, and fulfilling whatever virtual or contractual commitments they may have made. Said anglers are likely to suffer from amnesia in the form of “I promised to do what”? Any recent or longstanding obligations to family, employers, neighbors, medical professionals, and the like are likely to be obscured by amnesia at these times. Amnesia is most likely to occur during salmon and steelhead season. Trout-season amnesia is not particularly common, and is far less severe. This medical condition is not treatable with FDA approved medications; however, Twelve-step Programs have occasionally offered temporary relief. Alternate: Amnesia is an obsolete fishing line. 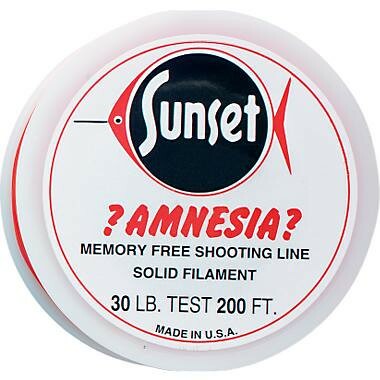 This line was manufactured by Sunset Line Company and when stretched, was promoted as suitable for use as a shooting line when fishing shooting heads. Stretching the monofilament line by hand, laying in loose coils on the floor of a boat or in a shooting basket was a pre-casting ritual practiced by salmon and steelhead anglers. Amnesia was offered in black, red, and chartreuse colors. Salmon anglers, especially, had preferences for one color or the other, believing that color choice increased their catch rates. Although not manufactured these days, it is common to find old-time salmon anglers who have hoarded somewhere around a thousand spools of the junk. Amnesia is both loved and hated. Typically fished in #30 and #40 pound test, with a double surgeons loop joining it to the shooting head, Amnesia typically has a breaking strength of somewhere between three ounces and four hundred pounds, depending on whether it is wrapped around a harbor seal (#400 Lbs) or if the angler has hooked a big King salmon (3 oz.). Investigative reporting has revealed that an international conspiracy exists among fly shop owners, a conspiracy intended to bring the fly fishing industry back from the brink of economic disaster during the current global meltdown. This conspiracy involves introduction of the “Dental Floss Fly” as a replacement of the Tube fly, which replaced the Waddington Shank, which replaced the Tungsten Bead fly, which replaced the Skunk. Market research predicts that the average fly fisher’s arsenal of fly boxes will reach full capacity of these current and historically popular fly-types during spring of 2010; full capacity as in “stuffed to the gills”. Therefore, the fly fishing industry is busily writing articles, garnering pro-angler testimonials, laying-out ads for magazines and fly fishing catalogs, and stocking up on these Dental Floss Flies in preparation of the strategic unveiling. The bodies of three investigative reporters were discovered last week, victims of drowning in the North Umpqua, wearing fly vests weighted-down with jigs. Information gleaned to date hints that the Dental Floss Fly will incorporate space-age polymers derived from melted balls of Spey tips pilfered from jockey boxes of trucks parked along the North Umpqua. Dental Floss Flies will be retailed as a discrete unit including Spey leader and fly. Pure marketing genius. 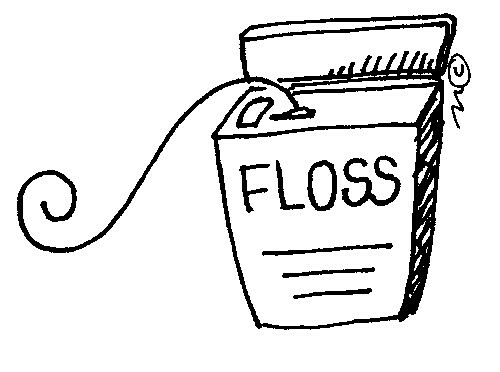 As planned, the Dental Floss Fly will retail for $27.95 but will only cost about a twenty-three cents to manufacture. Hypnotic subliminal advertising is already convincing fly fishers that the Dental Floss Fly has superior fish catching abilities. I believe it, and soon you will too. Really. This is a heinous practice of raining salmon or steelhead in net-pens in oceanic or estuarine environments, for the intended purpose of making boat-loads of money for the owners of these companies. Let’s get to the point. These are nothing short of nasty, are not ecologically sustainable, pose huge threats to wild salmon, and should be outlawed. These indisputable assertions are usually ignored by the prospect of providing jobs in small communities, providing cheap protein in the marketplace, and an aversion to interfere with capitalism, and the untoward influence of highly paid lobbyists. Experience has demonstrated that these salmon farming operations do in fact provide local employment opportunities in economically depressed rural communities, for a while, that is. Then the dang salmon farms become horrific hotbeds of sea lice infested, antibiotic-resistant, PCB-laced, dye-loaded, flaccid chunks of meat that isn’t fit for cat food. So there. I read it in Scientific American, I think. Eventually, these ecologically sick operations see the chickens come home to roost. But by then the damage has been done to wild fish and the local community suffers the most in this game, while the big corporations move on to pull the wool over the eyes of some new gullible nation. The only thing to do is pester your legislators to prohibit these monsters ever having an opportunity to be approved anywhere within three light-years of your home waters and to positively and always refuse to eat farmed salmon or steelhead. Obsolete fly fishing product. What were they thinking? Someone got all enthused with technology and decided to add a big spring to the side of a perfectly good single-action fly reel and market the doo-dad as an Automatic. Ridiculous. The things weighed four times more than a single action reel. Anyway, these were spring-loaded wind-up toys that many innocent fly anglers fell prey to back in the old days. These reels had a lever that, when depressed, caused the spring brake to release and wind the line in. When executed without a trout attached, the line would come shooting into the guides at mach-three, often pulling in all the line and stripping off all the guides from the rod before the hook embedded itself in the angler’s hand. Another common but unfortunate performance issue involved in releasing the spring brake with a smallish trout attached to the fly. This usually caused said trout to be flung over the angler’s shoulder and into the trees behind, where it would wrap several times around a branch, the leader would break, and the crows would begin to dine on lunch. 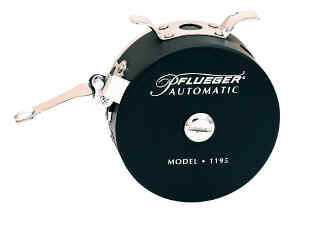 I had an automatic fly reel back in the sixties. It was black and was really fancy because it had one lever to release the spring break and a separate lever to apply friction to the spool, theoretically slowing the rate of line retrieval. I don’t remember who the manufacturer was. I do remember having trouble remembering which lever did what, and alternately having the line shooting in or not shooting in, trout launchings aborted mid-arc. Flies hooked in my nose, and crows complaining by my failure to provide their lunch. I also remember that it was necessary to pre-wind the spring before stripping line from the reel. Too little pre-wind would result in being unable to retrieve a trout within twenty feet of the shore. Too much pre-wind would result in speeds exceeding mach 4 and trout achieving escape velocity, thus denying crows any food whatsoever. These are now collector’s items, Duh. Jay, you’re shining new light on faded memories and helping to standardize the vocabulary of our lives. Thank you for that. You’re also bringing up painful memories in which Amnesia plays a starring role, accounting several times for the loss of both women and fish. And I really don’t like losing fish. Thanks Nate — i just hope there are some belly laughs in between the painful memories! Stay tuned in, more antics and investigative reporting to come in following months. My dad fished with an automatic fly reel his entire life, something called an Oren-O-Matic, No amount of teasing could convince him to give it up. That reel and his Fenwick fiberglass rod were his pride and joy. I have both of them. I keep thinking I should take them out for a spin in his memory. Greg, you are smart to have saved that outfit. I would indeed take it out on river or lake for a fun experience. Wish i still had the first fly rod and reel i ever fished too. Insert Big Sigh here. go git ‘em! Hi Jay. My dad used a South Bend Oren-o-Matic No. 1140 reel back in the 50s. I remember watching him and was very impressed. I still use that reel and love it. I have quite a collection of them now thanks to eBay. Martins, too. Not sure of the fly- fishing etiquette concerning the autos but I prefer them. I guess it’s what you grow up with. I’ve never had a problem with it but my fly-fishing cousin can’t work one for nothin’. He calls the autos, “blasphemous”. Can you imagine that?